A current account in turn requires that you have a specified location from which you are doing business. The bank will ask you to submit at least two documents as proof of business location in the form of government registrations such as shop act license, service tax, CST/VAT, etc. Need office space in Bangalore for starting a business? Contact Evoma now. Great location, serviced offices, all startup facilities included. I will explain in detail how to start and register sole proprietorship business in India, and all the documents required. 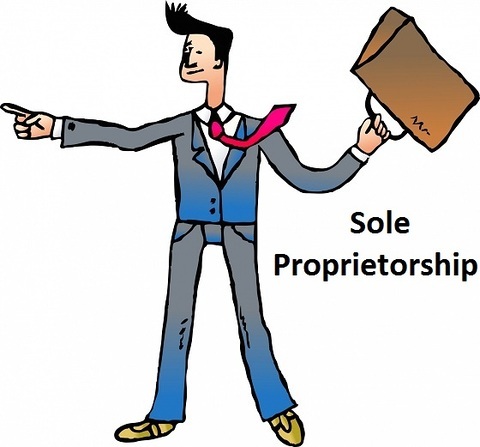 But first, let’s take a minute to understand the legal definition of a sole proprietor, and what are the benefits as compared to registering a Partnership, LLP, or pvt ltd company. One of the primary benefits is ease of formation, since a government registration is not required. There are no fees to be paid for starting a one-man business on your own, and there is no government regulatory paperwork and compliance to be fulfilled. There are no minimum capital investment requirements, and the proprietor has full control and ownership stake. You get to keep whatever profit or income you generate. Furthermore, the tax benefits of sole proprietorship prevent double taxation of the firm. You will file returns and pay taxes only in your personal name. There are no separate income tax returns to be filed and no tax to be paid by the firm. There are only two things you need to do for starting a sole proprietorship business in India. 2. Select a location as the place of doing business. Now you can legally start doing business. 1. Pan card and ID for address proof of proprietor. 4. CA Certificate – You can get this from any CA. They might charge you a nominal fee for giving you a certificate. Sole proprietors, startups, freelancers – Want a great office location and Bangalore business address? Evoma offers flexible coworking space.